Recent conservation work has uncovered extensive areas of the external rendering believed originally to have covered the outside of the curtain walls and towers. 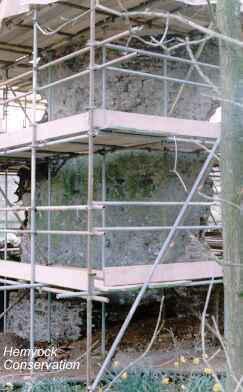 The remains of the NW tower had appeared very precarious and it was covered with ivy vines. 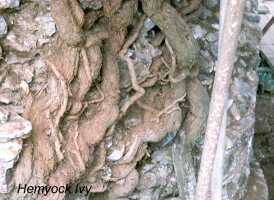 Some of these vines were as thick as my wrist. Experts had debated whether the ivy was supporting the tower and its leaves shielding the mortar from the rain; or whether its roots were destroying the masonry. Eventually they decided to remove the ivy. The masonry was then stabilised. Living thatch - special turf - was fitted to the top of this tower and the other walls to protect them from the weather. The NW tower has now been stabilised and conserved. Its masonry proved to be more substantial and better preserved than had been expected. This work also revealed unexpectedly large areas of well preserved medieval rendering on the outside surface of the tower. Originally, the external surfaces of all Hemyock Castle&apos;s wall and towers would have been rendered and lime-washed; partly to protect the masonry, partly to make them more slippery and more difficult to climb, partly to make the castle look more formidable. Archaeological work has proved that at least the four corner towers all did have ground-level entrances. The entrance to the south-west tower still has a slot for the door-post. In accordance with policy, the excavations were later filled-in, to protect the structures. 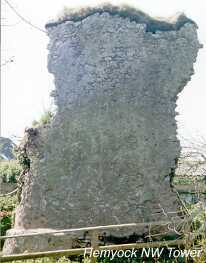 The southern gatehouse tower has the type of putlog holes normally used to support an upper floor. It also looks as if there was a chamber above the eastern entrance vault. Insufficient height remains of the other towers, but equally there is no evidence that these other towers did not also have upper floors. Unlike eg. the slightly later Bodiam Castle, the walls and towers of Hemyock Castle were built around an existing manor house or court. So there was less need to incorporate accommodation into the walls and towers; meaning that they could be simpler and designed purely for defence. After Hemyock Castle was slighted in the 1660s, following the Civil War, much of its stone was removed and probably sold for use in other buildings. This left the rubble core of the walls and towers exposed. However, small pits dug in 2018 during emergency repair work, unearthed quantities of facing stones. Much further work is needed to understand the site, but this survey has added considerable interesting evidence. Hemyock Castle is privately owned. The manor house is a private family house. The owners pay for the conservation and maintenance. English Heritage has made welcome contributions towards the high costs of specialist skilled workers and authentic materials. Mystery Finds in N E Tower. Translation of The Magna Carta.